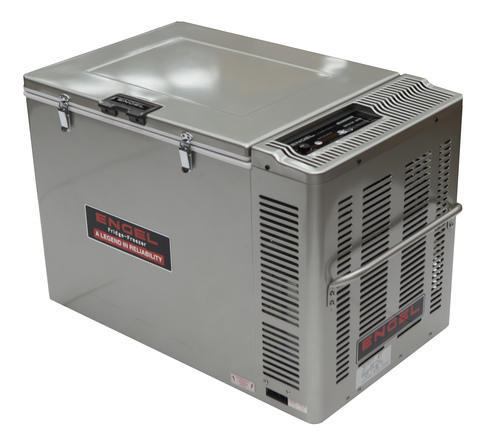 Engel MT80FP ... the largest addition to the Legendary range of Engel Fridge/Freezers. This Model has a huge 80 litre capacity with all the efficency and reliability you have come to expect from Australia's best portable fridge/freezers. The many quality features include a digital cabinet temperature readout for constant monitoring of the internal temperature. This model now features the new user friendly digital controls with built in battery monitor. This battery monitor has 3 settings, High, Low and Off. The 'HIGH' setting is a cut off for a voltage of 11.5 volts DC. The 'LOW' setting cuts of at 10.5 volts DC. And the 'OFF' setting turns the battery monitor off so that the fridge can run straight from your Power Film Solar panels or when the output voltage from your vehicle is low. Once again steel cabinet, steel handles, steel lid for durability. Supplied with both cords the 12 volt cord which plugs straight into your vehicle's cigarete lighter socket and the 240 volt lead with three pin plug. Auto switching between AC/DC power. Capacity: 80 Litrea or 118 cans. Note: Allow an additional 45-50mm each end of width for handles. Price: $1999.00 RRP Engel fridge only. $1795 with genuine Engel transit bag valued at $285 included Free of Charge. Phone or email for your Special Price.